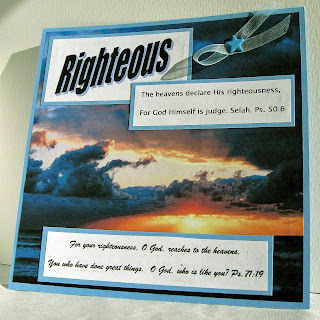 This was my 6 x 6 page for His Holy Name Challenge - Righteous. I used my computer to print off a beautiful sunset image. I always feel so close to God when I see the wonder and magesty of the sky! I chose verses that speak of His righteousness... Ps 50:6 says ..."The heavens declare His righteiousness, for God Himself is judge. Selah". Ps 71:19 " For your righteousness O God, reaches to the heavens, you who have done great things. O God, who is like you? I hope you enjoy this beautiful photo and the verses I chose. If you'd like to play along on this challenge... please click on the link down on the right side of my blog... His Holy Name Challenge. Wow! Now ,I love all of your pages, but I think this one is my favorite! Just look at those colors!! Just stunning! I love photos of "crowning" like this one. Just glorious. Another beautiful page. Would you email me so I can discuss two things with you. I'd like to invite you to be a guest writer on Women to Women, and I'd like to feature your blog on mine. From time to time I introduce new bloggers, and yours definitely deserves some attention...so inspirational! Look forward to hearing from you. Just go to my profile (click on my name above this post which will take you to my profile and you can email me from there).